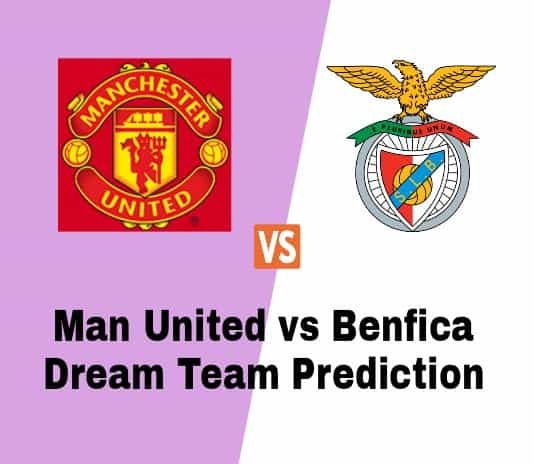 Hello welcome to Manchester United vs Benfica Dream11 Football Team Prediction, Fantasy Preview, Predicted Lineups and Team News. We cover BEN vs MUN Dream11 Football Team Prediction and Predicted lineups. Man United vs Benfica Will be played on 01/11/2017 at Old Trafford, Manchester. Man United have scored 23 goals, while Benfica have scored 11 goals. Man United won 7 matches and Benfica won 1 matches, while 2 matches were drawn. Man United have scored at least 1 goals in their last 4 matches in all competitions. Benfica have scored at least 1 goals in their last 2 matches in all competitions. Man Utd have won 3 matches, 1 draw, 1 loss in their last 5 matches. Benfica also have won 3 matches, 1 draw, 1 loss in their last 5 matches. Man United : R Lakaku 3 Goal, M Rashford 2 Goal. Benfica : H Seferovic 1 Goal. Mourinho confirmed on Monday that United “have the same players from the weekend” to face Benfica. That means Jose Mourniho will be without the services of Paul Pogba, Zlatan Ibrahimovic, Marcos Rojo, Marouane Fellaini and Michael Carrick. Benfica will be without Andrea Almeida and Luisao both unavailable through suspension, and Douglas and Jardel set to miss out due to injury. Note: Before going to this team remember this is temporary team. In UCL 90% lineups will come before deadline of dream11. if you able to update team in night then you will go with this team. you will get lineups of this match here Live score and Lineups. Also Follow both teams Twitter Account and champions league twitter account. Man United is very strong team than Benfica. so take 7 players from Man United. If you liked this article BEN vs MUN Dream11 Football Team Prediction, then please subscribe to our Email Newsletter For Latest cricket News, Fantasy Previews, Playing XI and All information about Dream11 Fantasy Football. You can also find us on Google+ and Facebook.